We always mourn the loss of a bird, especially a young bird. For a bird like Dewey, there is nothing that adequately expresses our sorrow. Dewey died at two years old. 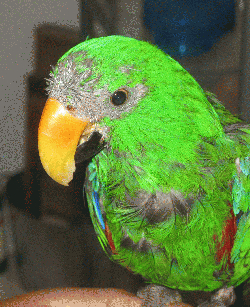 He had psitticine beak and feather disease (PBFD) and he had probably been sick his entire life. Mickaboo did what we could for him, but it was obvious that he was dying when he came to us. PBFD is fatal - there is no cure. When we learned that we could not keep him comfortable and free of pain, we asked one of our avian vets to humanely euthanize him. Dewey was sold three times by the same pet store. Two buyers returned him, and the third took him to a vet and learned what was wrong. Please remember Dewey. And ALWAYS take your new bird companions to an avian vet for a baseline health exam.